Embattled Chinese telecom giant Huawei has some new problems. The US Department of Justice on Monday unsealed a 13-count indictment against Huawei and its CFO, Meng Wanzhou, alleging the company misled banking partners about violations of US sanctions against Iran. The charges include bank fraud, wire fraud, money laundering, and obstruction of justice. Meng, who is also the daughter of Huawei founder Ren Zhengfei, was arrested in Canada last month and is awaiting extradition to the US. In a separate case, the DOJ indicted Huawei for stealing intellectual property related to a cell-phone-testing robot from T-Mobile in 2012. The indictments arrive during a turbulent time for Huawei and for US-China relations. Earlier this month, a Huawei employee was arrested in Poland on espionage charges. Meanwhile, a growing number of countries, including Australia, the UK, Canada, Taiwan, and Japan, have either banned telcos from using Huawei to build 5G wireless networks or are considering doing so. London-based carrier Vodafone, one of the world’s largest wireless carriers, said Friday that it would pause purchases from Huawei for use in European infrastructure. The global campaign against Huawei has become a sticking point in talks between the US and China over trade, tariffs, and intellectual property. The US government has long warned that Huawei could pose a national security risk to the US, arguing that Huawei could build backdoors into equipment that would allow the Chinese government to snoop on communications. Huawei’s phones and equipment are effectively banned from the US. But Monday’s indictment revolves around Huawei’s relationship to a Hong Kong-based company called Skycom, which sold Huawei-made equipment to Iran. The DOJ alleges that Skycom is a subsidiary of Huawei and that Meng had served on Skycom’s board of directors. “Huawei employees lied about Huawei’s relationship to a company in Iran called Skycom, falsely asserting it was not an affiliate of Huawei,” the DOJ said in a statement. The indictment alleges that after media reports of Huawei’s ownership of Skycom surfaced in late 2012, Meng and other Huawei executives lied to banking partners, claiming that Huawei had sold its interest in Skycom in 2007. 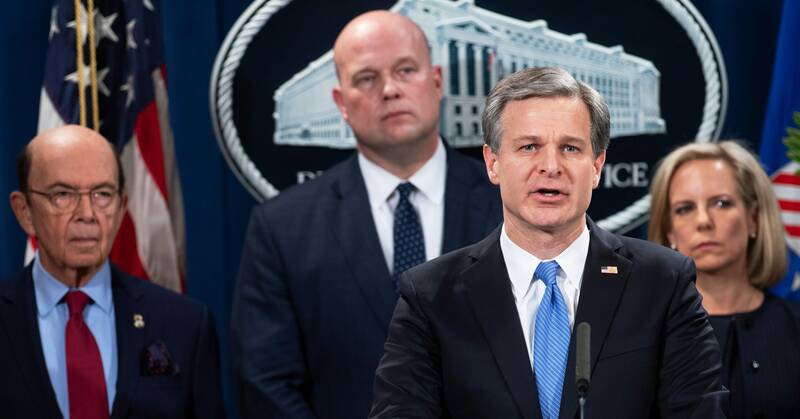 During a press conference, FBI director Christopher A. Wray said Meng was indicted for her actions, not those of other employees. Huawei has not responded to our request for comment. It’s not clear what the consequences will be for Huawei, but at the very least the government wants to seize any ill-gotten assets. Last year the US government imposed sanctions on another Chinese telco, ZTE, for selling equipment to Iran, banning US companies from selling software and components to the company. But the US backed down after ZTE said the sanctions would force it to halt operations, including purchases of US-made components. In the T-Mobile case, the DOJ claims that Huawei employees stole part of a mobile-phone-testing robot developed by T-Mobile called Tappy and violated non-disclosure agreements with the carrier by secretly snapping photos and taking measurements of the robot. T-Mobile sued Huawei over the allegations in 2014, and a jury awarded T-Mobile $4.8 million in damages in 2017. But the new indictment is a criminal, as opposed to a civil, case. It’s not the first time Huawei has been accused of stealing IP from US companies. Cisco sued the company in 2003 and settled out of court. During the press conference, acting attorney general Matthew Whitaker called on China to crack down on criminal activity by Chinese companies.